A Mindful Way Counselingâ€™s Sisters Healing Circle is back with our quarterly outdoor event! Spring is here and itâ€™s the season to bloom exactly where you are planted! This event is open to all Black womxn so bring a sister with you and please respect that the space is specifically curated for the unique experiences of sisters who identify Black including those who are gender nonbinary. 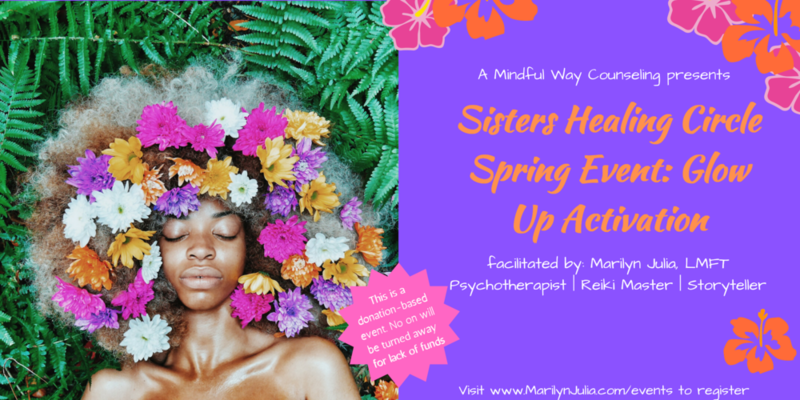 What: Marilyn Julia Brown, MFT, psychotherapist and energy healer will guide you through a meditation and sound activation to prepare you for the growth season ahead! Where: The Strand, Manhattan Beach (on the beach northwest of the Surf Food Stand). Visit the Eventbrite page for more details and to register below!